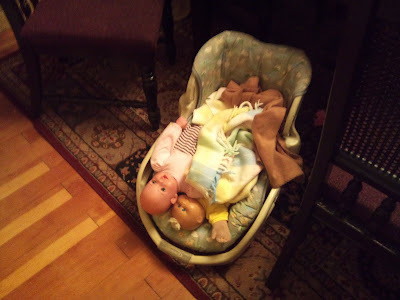 It has been really sweet that my rough and tumble, cars and trains, mud and dirt little boy has been very interested in baby dolls lately. We've spent the last few mornings dressing babies, changing their diapers, being "daddies", taking them to the park, feeding them, playing "Christmas" and snuggling them. 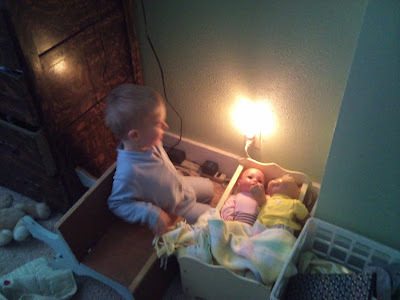 Here he is putting them to bed and turning on the night light for them so the "bad guys won't get um". Can you see his little house he constructed? So cute. I've really been encouraging him in this because I think it is really important for little boys to develop nurturing skills. In a world where boys and men are often taught to suppress their nurturing instincts I want him to know that righteous men of God are nurtures. I'd love to see him be a man who honored the title of "father" above all others, who valued life, and had the skills to raise his children in love and security. I'm glad he loves his babies. It melted my heart when a few days ago I came downstairs and found his dolls all ready to go in the car. I think he will make a good father... one of these days. So sweet! And what a nice compliment to Jon that this is how Asher plays. Oh my word, I love this! It makes me smile! He reminds me of my little guy who is 2. I feel so blessed to be raising a little man who will hopefully be a great father someday too! Our girls need good, righteous men to marry and it makes my heart happy to see you are doing such a good job raising a worthy man! Hugs to you!! !